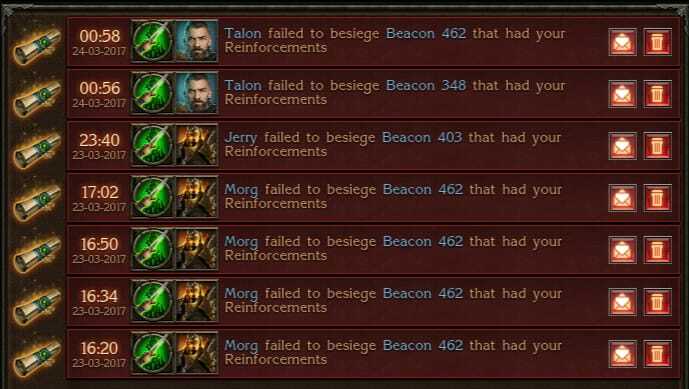 Another Beacon Massacre, another day filled with suffering and grief. Many suffer on this day, but some are completely and utterly wiped out in the process. 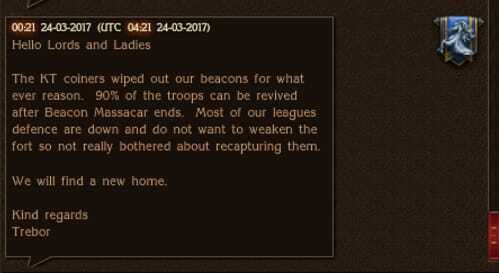 Another Beacon Massacre, another day of bloodshed and grief. These events, which now appear to be a regular fixture within our realm, have drastically altered the course of Stormfall’s history forever, for better or worse. The massacre, just like so many within the recent past, started off slow, with many leagues simply choosing to take the “wait and see” approach--yet the wait was, as always, broken in an instant and the floodgates were opened. The first league to strike was Anarchy, who has indicated that they were using the day’s bloodshed as a training exercise for many of their up and coming members. Following on the heels of this action was another familiar face, Destiny, who struck out against an old enemy of theirs, the Unforgiven Knights. Once these actions had taken place and the blood was in the water, a sea of red quickly washed over the realm as it descended into a feverish bloodlust and state of madness. The race for destruction was on and it was indeed a sight to behold. 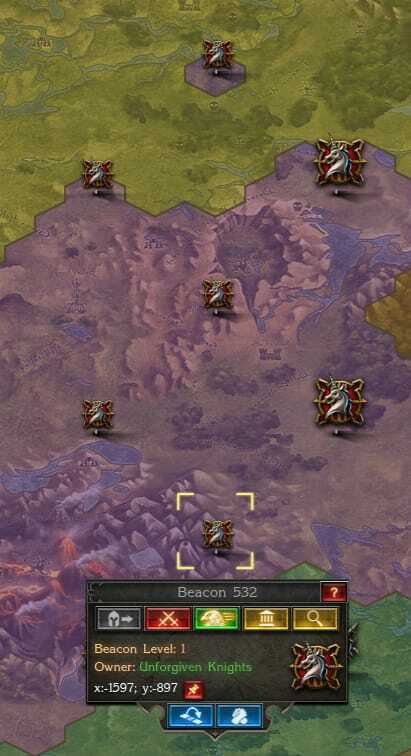 The Anarchy league proceeded to wipe MaD Nations completely off the map, destroying each and every one of their beacons in the process, sending their league into a state of confusion, as their members sought best how to deal with the overwhelming forces. But this was far from the only action of the day. 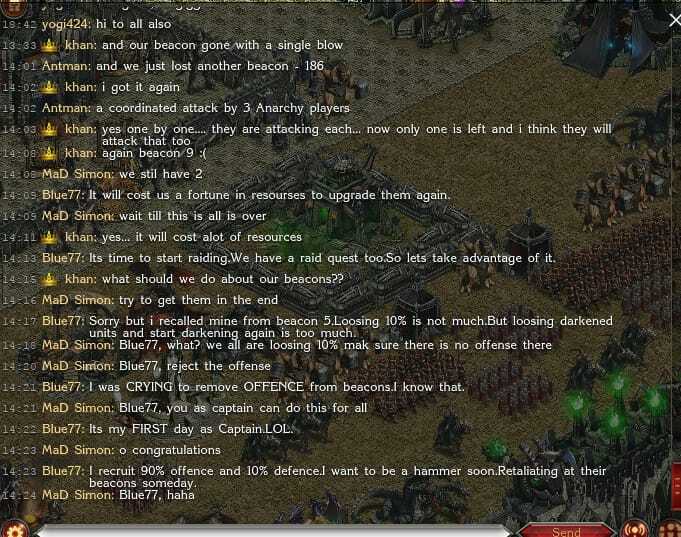 All over the realm, leagues waged war against one another. 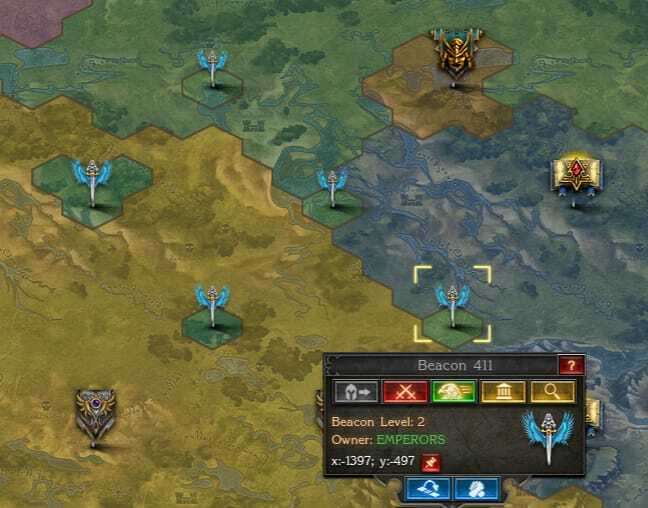 The Emperors, who have just recently reemerged as holders of beacons, found a number of their newly gained beacons under siege. They retaliated in kind, striking back against their enemies. 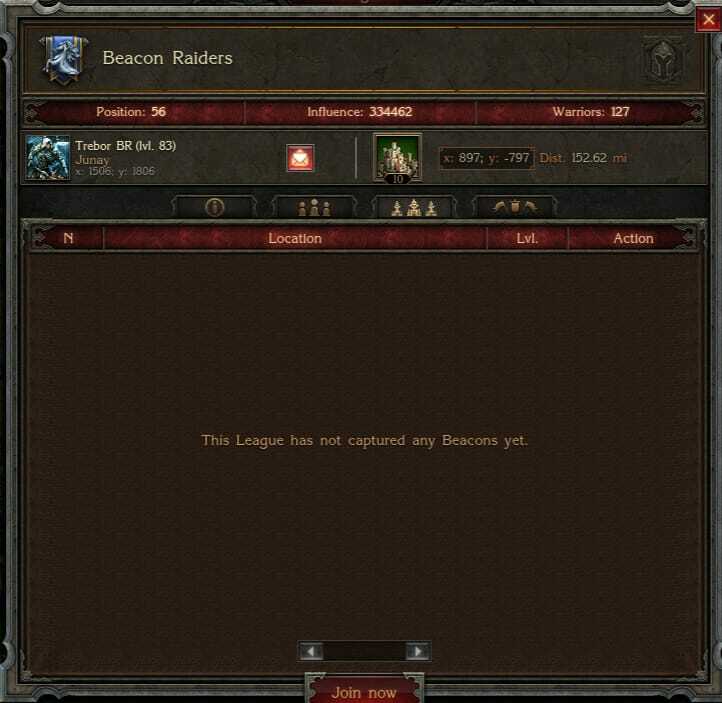 Meanwhile, the Knights Templar proceeded in an organized effort to wipe the Beacon Raiders off the map, an action which completely and utterly decimated the entirety of the Beacon Raiders forces and demoralized their leadership in the process. Unable to cope, their Marshal has recently stepped down. In the North, another battle erupted between the Walking Dead and the Dominus league, who at the time held the number one position within the realm. Launching attack after attack, the forces of Dominus slowly whittled down the collective defense of the Walking Dead and eventually won out the day on their chosen target. The aabove-highlighted battles are a small but poignant sample of what unfolded throughout this horrific and violent day. 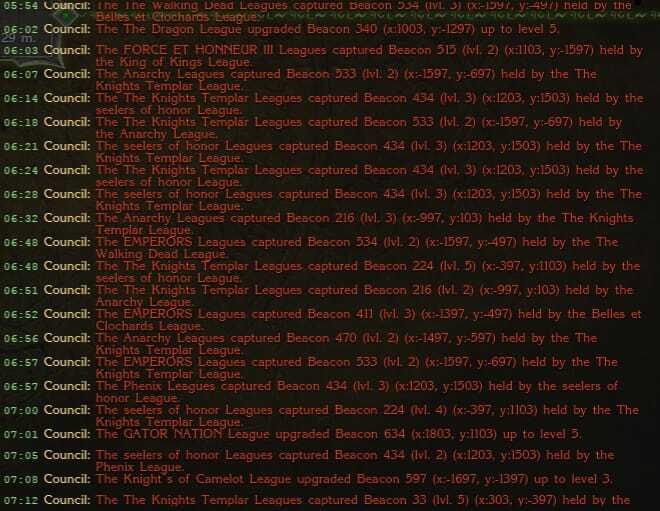 They paint a distinct picture of the mood that was felt by all citizens of the realm, as a wall of red text flooded their reports. 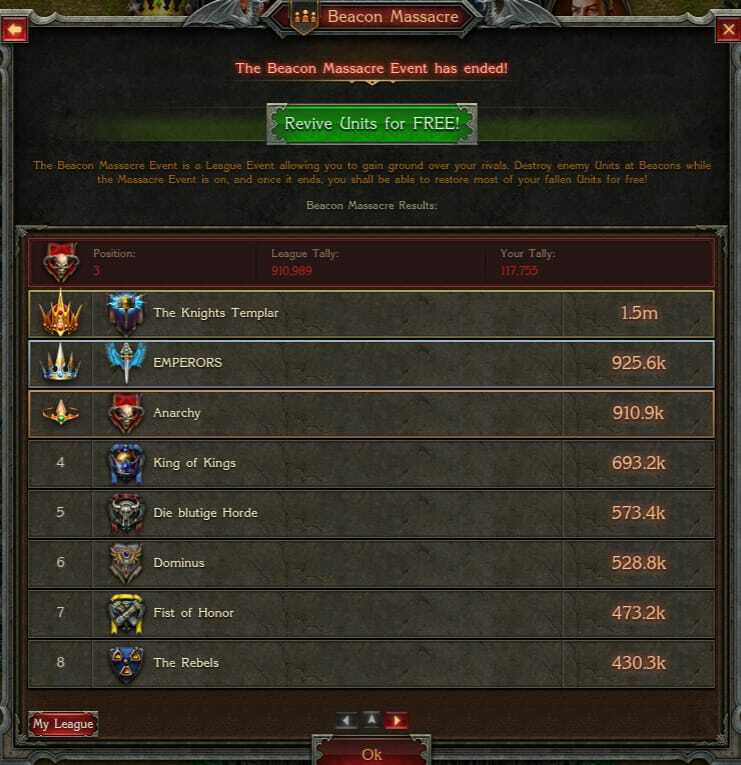 In the end, the results were announced and a set of familiar faces once again appeared within the top rankings, with the Knights Templar, Emperors, Anarchy, King of Kings and Die Blutige Horde taking the top five positions. 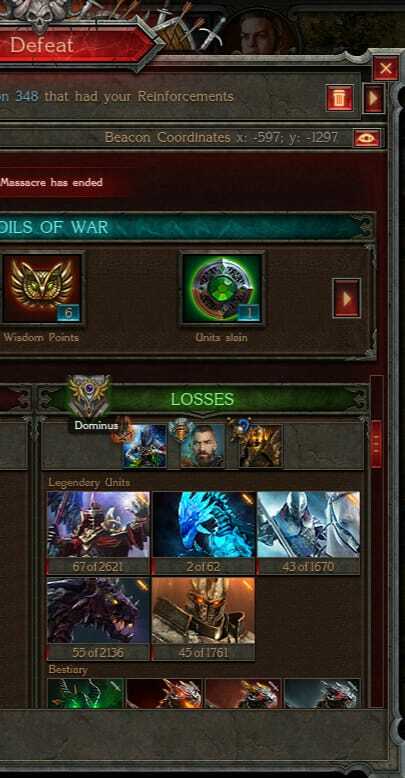 With the gods’ cruel joke over, 90% of those fallen rose again. With scattered memories of the horrors they witnessed, they returned to their homelands, awaiting the next time they are summoned into the fray only to be cut down again.